The Comprehensive Assessment of Soil Health is designed for farmers, gardeners, agricultural service providers, landscape managers and researchers who want to go beyond simply testing the nutrient levels of their soils. It is the first commercially-available laboratory soil health test that provides standardized, field-specific information on important constraints in soil biological and physical processes, in addition to standard nutrient analysis. 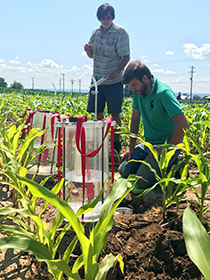 The Assessment is regarded as a key tool for soil health measurement by several national initiatives, including Soil Renaissance, the Soil Health Partnership, and the USDA-NRCS Soil Health Division. We have conducted over 10,000 soil health package analyses since its rollout in 2006. Half were for commercial customers. In addition to the laboratory results for each sample, we have developed a soil health management planning framework included with the sample assessment results to help you focus management changes where they will be most effective in improving your soil. The assessment’s indicators and management strategies for improving soil health are also detailed in the Comprehensive Assessment of Soil Health Training Manual, available free online. Beginning June 1st 2016 each individual sample needs to be double bagged prior to packaging and shipping. Packing material such as crumpled paper or bubble wrap must be placed in the box with the samples to prevent sample movement and spillage during shipping. For more details on proper packaging and shipping instructions, please visit the ‘Testing Services’ tab on our website. There are certain counties in the US where soil should neither be packaged nor shipped. Soil received from these counties will be destroyed without processing. For a complete list of prohibited counties please visit the ‘Resources’ tab on our website.